This is a 6" x 6" little canvas. Sometimes working small can be a lot of fun. I usually work on a larger scale but here I was trying out metal embossing and acrylics. Embossing the metal sheeting was very liberating and challenging at the same time! 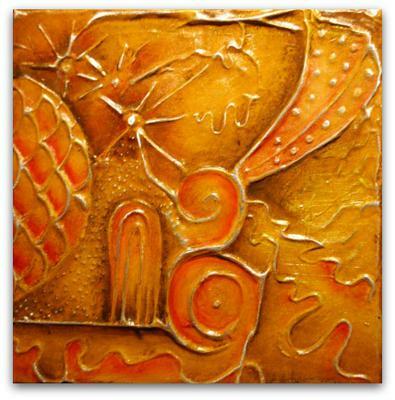 It was easy to adhere the metal sheet to the canvas after creating the embossed images. Then I got down to having fun by adding more shading with acrylics to finish telling my story. This piece is sold. I used the large point of a stylus. I lay the sheet of metal face down on a thin foam surface and I applied just enough pressure to emboss the sheet. I began with swirls and then squiggles and basically doodled my way mindlessly until the design began to suggest a journey of sorts. That's when I added the arched door. I flipped the sheet face up and then I shaded some areas with Burnt Umber and I added vivid tints of Pyrrole Orange. Once I was done with that, I added a generous layer of Golden Matt Gel Medium to the canvas with a palette knife. I positioned the metal sheet over the canvas, pressing down to make sure there was good contact and left it to dry for a few days. The metal sheet was about 1-inch larger than the canvas on all sides. I used scissors to cut into the corners so that I could wrap the metal all around the gallery canvas, using the gel as glue. The final step was a gloss varnish to enhance the texture and to protect the painting. If this was not sold I would want it. What tool did you use for the embossing? What did you adhere it to the canvas with? OMG, I love it! I should mention that the metal sheet was pre-colored in an antique gold.